You’re full of big ideas — but you’ve had your fill waiting to share them with others. 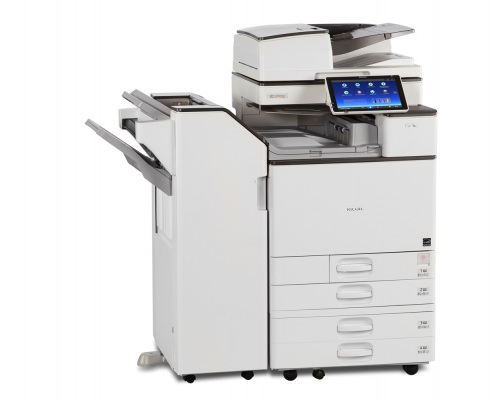 Use the extended capabilities of the RICOH MP C3004ex/MP C3504ex Color Multifunction Printer (MFP) — including service support, connectivity, customization and workflow apps — to simplify how you move information throughout the office and across the world. Automate everyday tasks with customized icons via the 10.1″-wide Smart Operation Panel and Workstyle Innovation Technology. Receive fast, reliable support at the touch of your finger with Web Help*. Add more convenient widgets and apps for easier access to critical information. Grab files from cloud-based applications with your personal mobile device and print them at the MFP. Use advanced scanning and paperless faxing to share messages instantly. Plus, you can choose from multiple paper stocks and finishing options to produce output sure to impress.